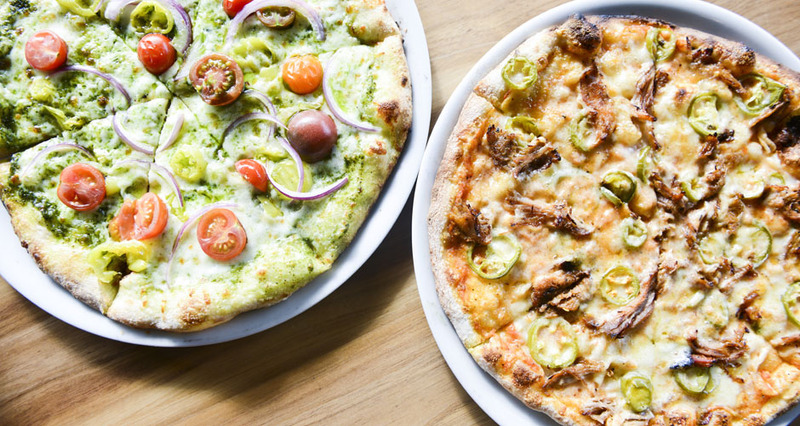 Eat Photo Essay: Craft-Beer and Wood-Fired Pizza Heaven at Ithaca Beer Co.
Photo Essay: Craft-Beer and Wood-Fired Pizza Heaven at Ithaca Beer Co.
We stopped by Ithaca's O.G. 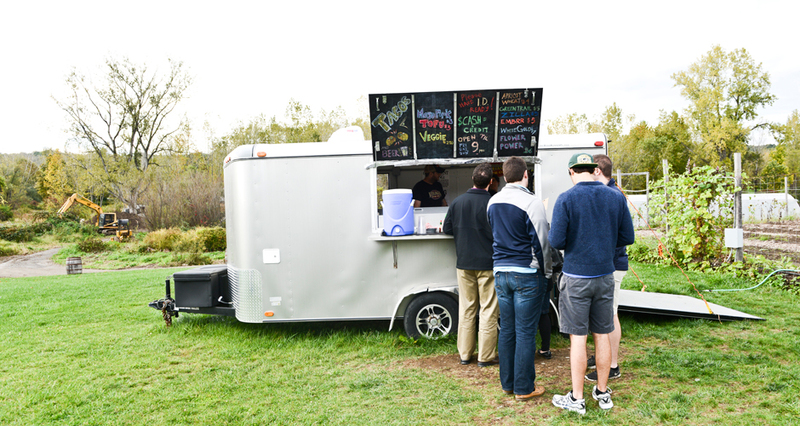 craft brewery to sample draught-only beers and BBQ pulled pork pies. Most New Yorkers visiting the Finger Lakes head straight to the region’s wineries, known mainly for their Rieslings, Gewürztraminers, and ice wines. 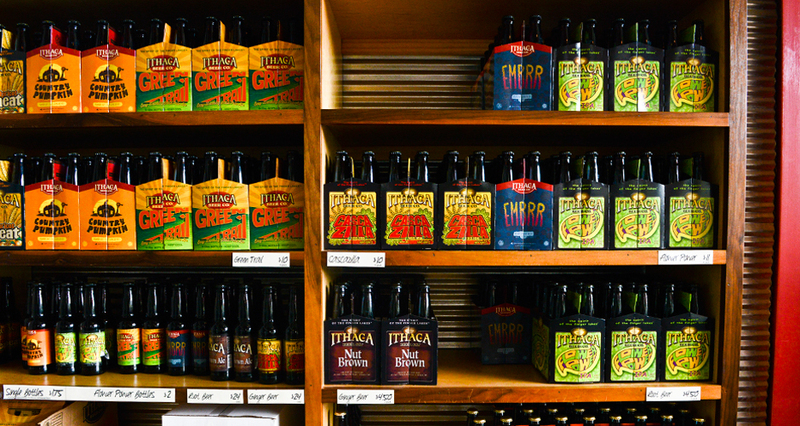 But it’s a shame to miss out on the area’s lesser-known but increasingly vibrant beer scene. 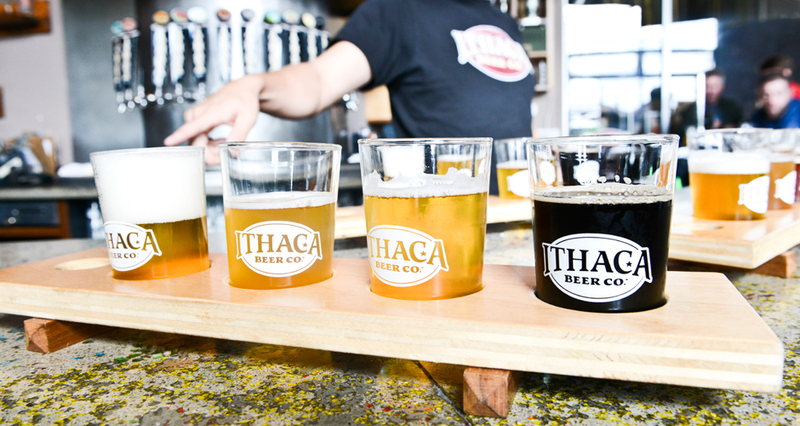 Breweries like Bacchus, Good Nature, and Hopshire have recently come onto the scene (and definitely deserve a visit), but it was Ithaca Beer Co. that first put the Finger Lakes on the craft-beer map. 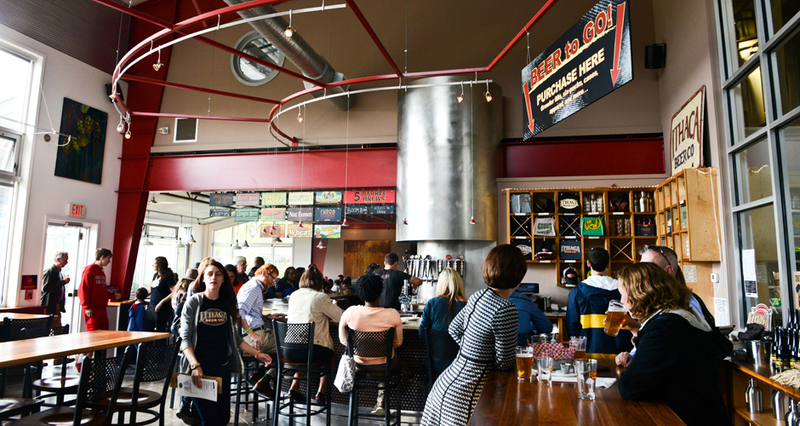 The trailblazing brewery opened its doors in 1998, and has since moved locations down the road; opened a gorgeous, light-filled taproom; started a wood-fired pizza program; and expanded to a 50-barrel brewhouse. Jeff O’Neil, who had a nine-year run at IBC as head brewmaster, brought the brewery national recognition with insta-classics like the Flower Power IPA. O’Neil has since moved on, and is now turning Peekskill into one of the state’s most exciting breweries with an ambitious sours program. Earlier this year, Andrew Hausman came on as IBC’s new brewmaster; Hausman has kept the brand going while continuing to add new beers to IBC’s portfolio, like Ithaca’s latest seasonal offering, Embrr. The bold porter is chocolaty with a hint of rye spiciness—a perfect beer for a cold afternoon (Ithaca has a lot of those). Another of Hausman’s standout fall brews: a draught-only, wet-hopped beer called Outdoor Ale. 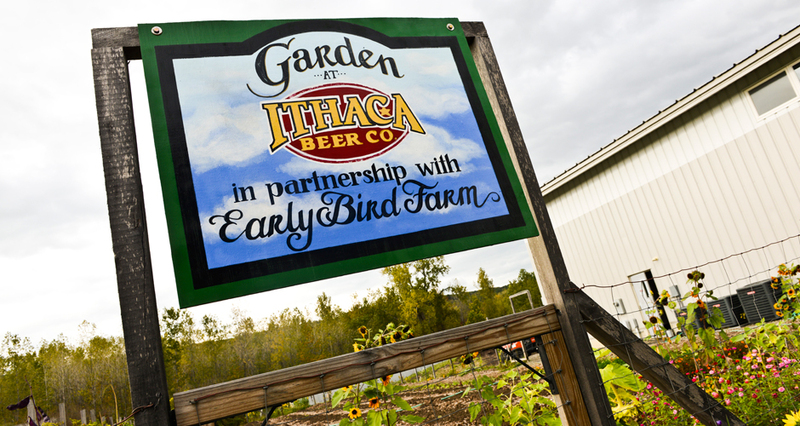 The crisp, floral is brewed entirely with New York state Cascade hops from Pedersen Farms. 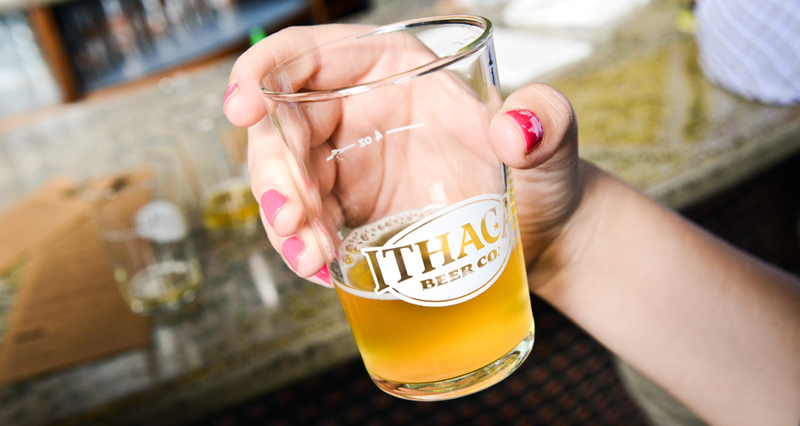 Visiting IBC’s taproom is the ideal way to spend an afternoon in Ithaca—preferably after visiting the Ithaca Farmers Market (which puts NYC’s Greenmarket to shame), and hiking through Taughannock Falls State Park. 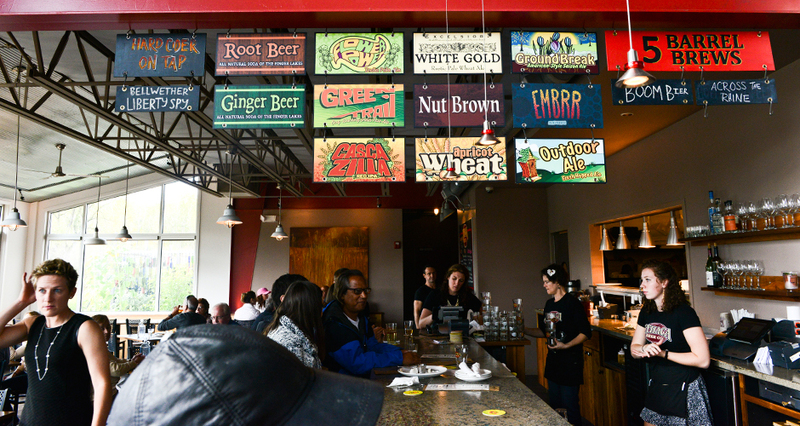 The taproom boasts 14 IBC beers on tap, housemade root beer and ginger beer, and locally-made hard cider. Our suggestion: order a year-round, seasonal, or hop-focused beer flight, then embark on a tour of the brewery (offered Saturdays and Sundays, 12-4pm) before wandering out into the taproom’s massive outdoor patio and garden. 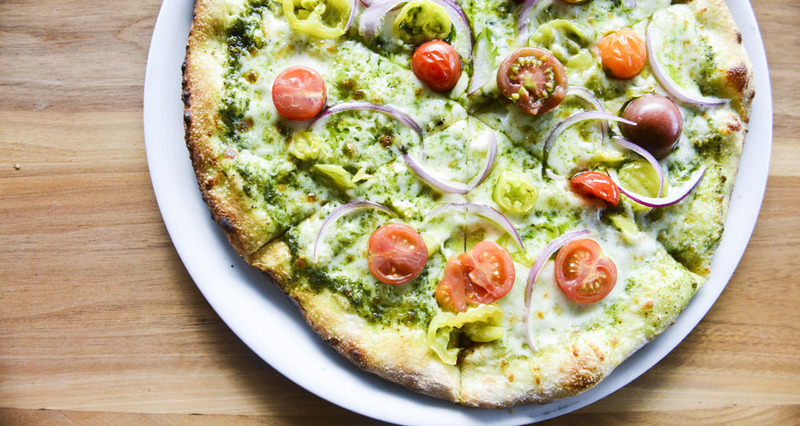 Another reason to visit IBC: The taproom’s wood-fired pizza program, started by the talented Leslie Muhlhahn of Ithaca’s Finger Lakes Flat Bread. Last year, Brian Welch took the reigns as taproom chef; he makes his Neapolitan-style dough using high-gluten flour sourced locally. “The high-gluten flour allows us to stretch a thin crust center and still maintain a crisp doughy crust handle,” says Welch. The IBC chef cooks the pizza in a 680°F, wood-fired oven, resulting in a brewpub pizza that is one part Neapolitan (due to its puffy, chewy crust) and two parts New York State (all the ingredients are sourced locally or made in-house). 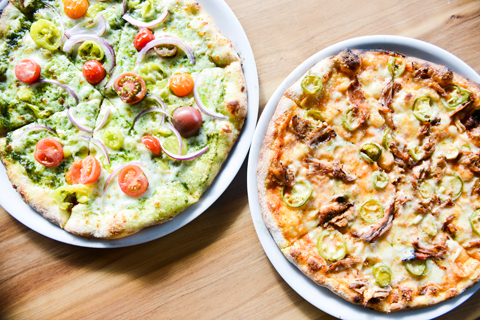 We recommend the constantly-changing pizza special, which makes use of produce from the brewery’s garden. 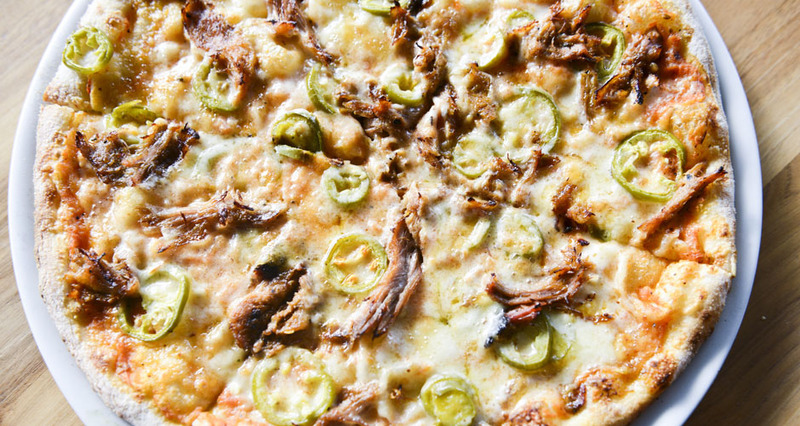 But if you’re feeling really indulgent, go for the pie topped with BBQ pulled pork, NY state Cheddar, charred tomato sauce, and pickled jalapeños. 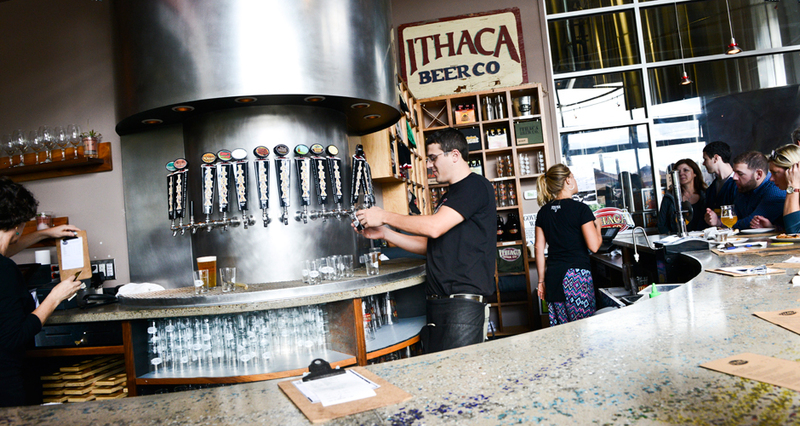 Ithaca Beer Co is located at 122 Ithaca Beer Dr in Ithaca, NY. The tasting room is open to visitors Wed–Sun, noon to 9pm. 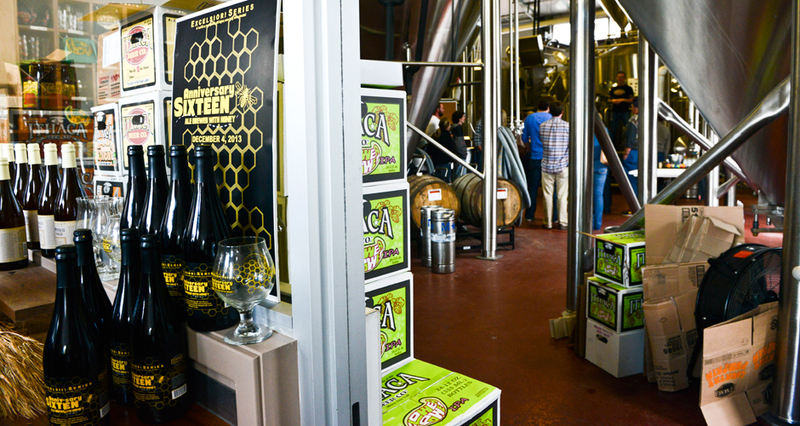 Click through the gallery above to for a look inside the brewery and tasting room. Wood-fired pizza with garlic-herb oil, parmesan, tomatoes, peppers, and pickled red onions. 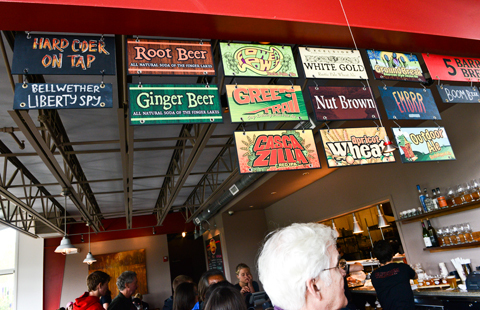 The taproom features 14 rotating beers on draught, as well as housemade ginger beer and root beer. Along with IBC mainstays like Flower Power and Cascazilla, there are plenty of seasonal brews like Ground Break American-style saison, Embrr porter, and Outdoor Ale (made entirely from NY-grown hops). After loading up on beer and pizza, IBC visitors embark on a tour of the brewery. Not feeling pizza? There's a taco and beer truck parked out back. 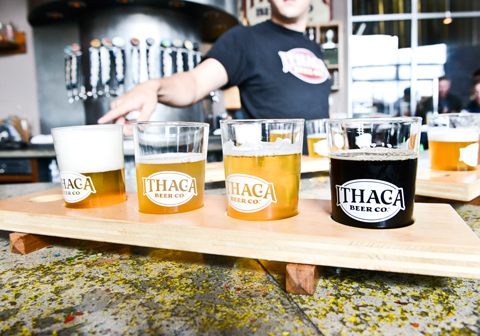 Ithaca Beer Co distributes to NY, OH, PA, VT, NH, ME, MA, RI, NJ, and CT. But you can always bring a six pack home from the brewery. IBC has an on-site garden. The vegetables grown here find their way onto the taproom menu. A beer flight is never a bad idea.